Imagine walking along the beach on a bright summer day. The cool salt water rushes in to swirl around your ankles, then races away playfully. A slight breeze brings a whiff of salty ocean air. You hear seagulls squawking all around you. The taste of the briny ocean air is on your lips as you watch the sun set over the immense ocean. 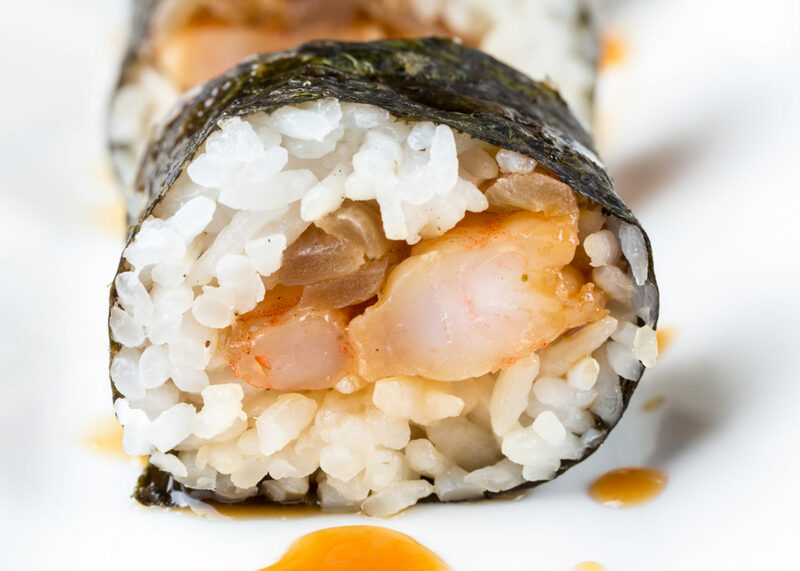 After a perfect day at the beach, you need a perfect meal, so why not a summery sushi? To me, summer means one thing – lots of grilling. Perhaps some sweet, salty, teriyaki marinated shrimp on the barbecue? Maybe grill (or even better, saute) an onion, until the bitterness is gone and all that’s left is a soft sweetness? And maybe, just maybe, roll them both in a sushi roll. The result? Absolute heaven. Wonderfully delicious. Completely worth all the effort needed to make it. Mix shoyu, water, sugar, garlic, and ginger to make a teriyaki marinade. Marinate shrimp in the teriyaki marinade for one hour. Soak ten wooden skewers in water for 30 minutes. Thread shrimp onto skewers, three to a skewer. Grill shrimp until they are no longer translucent. Slice the onion into 2 cm slices. Saute onions in butter until translucent and browned. 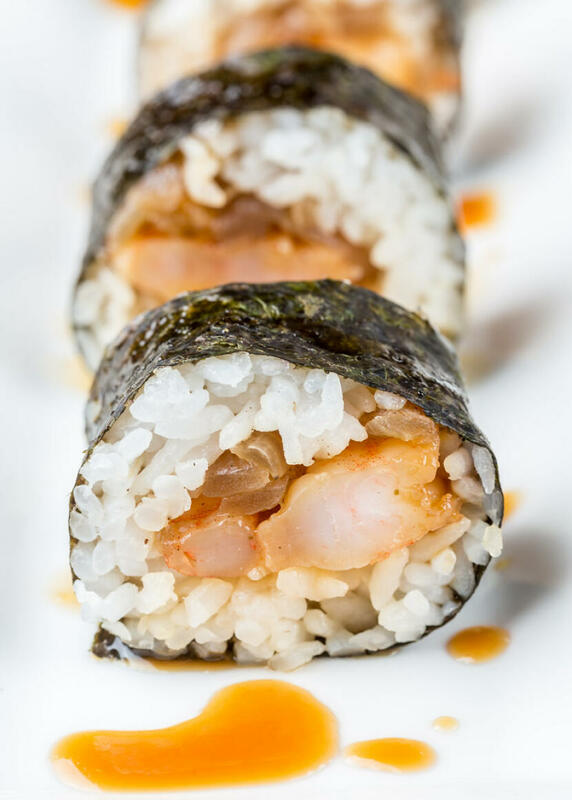 Roll the sushi, using five shrimp and some grilled onions as your fillings. Heh. This is one to try… it’s amazingly good. May have even made it to my top-ten list of sushi I’ve made. Yvo – That’s my perfect day, for sure. Amy – I tend to make a lot of different sushi when I buy sashimi since the pieces are so big and expensive, so that’s why there have been so many raw fish recipes lately. I’ll make sure to keep the non-fishy recipes coming too though! Like Amy, I have problems finding raw fish of any quality so I like the cooked sushi fillings. Well then, I had better find a happy balance between sashimi and cooked recipes. 🙂 More cooked sushi fillings to come, I promise. Thanks for the recipe, Allison. I’ve never tried to cook sushi myself before and I think now it’s good time to try.